This catnip formula is ideal for use with scratching pads, beds, and toys of all shapes and sizes. It is very important to make sure you select the proper size & type of chew or toy for your dog's age, weight & chewing strength. Imperial Cat - Certified Organic Catnip - 1 oz. Comprised of potent leaves and flowers, this catnip is ultra-aromatic and so fresh, it's still green! Resealable, 1 oz bag. USDA Organic. Sensitivity to the active ingredient in Tiger Grass Catnip (nepetalactone) is an inherited response that is found in more than 50% of all cats. This chemical is similar to normally occurring cat pheromones that cause cats to be happy and excited. It’s just the stuff to get any party started! Zoom on, little floor muffins! Can be used on your cat’s favorite toy or just give ’em the nip. Get In Touch. Houseplants are often toxic and therefore not suitable for consumption. The Catit 2.0 Grass planter has been built with a stable design and is easy to clean. Compatible with senses 2.0. Date First Available: 22 Sept. 2015. "WORLDWISE-SmartyKat: Certified Organic Catnip. Gives a burst of energetic fun for cats. It is 100% organic, safe, pure and potent. Imported.". Sales & Specials. Product images are for illustrative purposes only and may differ from the actual product. A natural stimulant for cats. 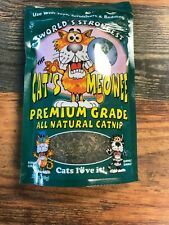 Kong Naturals Premium Catnip 56g. Catnip infuséd. KONG® Cat Naturals. and teaser poles. Each Cat Naturals toy is infuséd with the finest. The toys are designed to appeal to a cat's natural instinct to chase. Cat Grass Greens grow in pods. Sow in shallow container with soil or turf substrate. Cat Grass Seeds. suitable even for absolute beginners. We do everything to ensure you receive quality seeds. Simply fill the pouch with catnip and watch your cat roll, claw, tease and more! Kong Catnip Cat or Kitten Toy Beaver. Perfect for encouraging your cat's natural behaviour with the use of Catnip. Catnip included. Provides hours of feline fun. Catnip Mice 4 x pcs. Box Contains. Irresistible scent, texture and shape Refillable catnip toy in the shape of a hedgehog. Irresistible scent, texture and shape. Soft and snuggly plush. A reclosable pouch to hold fresh catnip securely in place. Kong Catnip Cat Kitten Toy Cat Grey Pink Refillable Washable Play. Refillable and Resealable Pouch holds catnip securely in place. Keep Catnip fresher for longer in a freezer. SHARPLES' HERBY CATNIP MICE 2 x Mice. Sup 'R' Mice & Catnip is a fantastic addition to the 'Ruff 'N' Tumble' range of cat toys by Sharples Pet. Made from brightly coloured felt and feathers, these catnip-filled mice toys can provide hours of chewing, clawing and licking fun. Sup 'R' Catnip is fantastic natural product in The 'Ruff 'N' Tumble' range by Sharples Pet. Provided in a resealable bag to prolong freshness, This catnip can be used inside toys or used on it's own to drive your cat wild. Sup 'R' Catnip is fantastic natural product in The 'Ruff 'N' Tumble' range by Sharples Pet Provided in a resealable bag to prolong freshness, This catnip can be used inside toys or used on it's own to drive your cat wild. Wheat (variety not stated) 99.16%, other crop seed 0.00%, inert matter 0.76%, weed seed 0.08%. Grow the grass your cat craves right in the bag! All you do is add water! Give us a chance to resolve the situation. Gimborn CAT NIP PLUS Cat Treat GROW YOUR OWN! Pure fun and an irresistible lure for cats, CatNip Plus brings fresh, live catnip indoors for easy growth. CatNip Plus contains premium catnip seeds to ensure the full flavor and aroma of fresh catnip. Grow your own Organic Cat Wheat Grass - 8 to 12 week supply -Just add water! Simply place the pot in a shallow dish and add water to the dish. Drizzle a little water directly on the seeds, but be careful not to dislodge the seeds too much. Avoid over watering to reduce the growth of mold, but it's not usual to get a bit.